Suffering from Digestive System problems? If you're suffering from digestive system problems, you're not alone. Have you been diagnosed with Crohns disease, irritable bowel syndrome, colitis, chronic constipation, or another digestive disorder? Or do you have digestive system problems but no doctor can figure out what's going on? Have they tried putting you on medications full of nasty side effects? You wouldn't believe how often I hear from people just like you! Would you like some natural help that can actually help you HEAL for good? I hope you’ll share what has helped you with any digestive system problems in the comments – collectively we can help a lot of people! By the way, did you know that most people who have digestive problems also suffer from at least occasional anxiety and depression too? It's all related guys, it's called the “gut-brain connection”. That's why a lot of the below suggestions will also be found in the post on How to Fight Anxiety and Depression Naturally. Remember, I'm not a doctor, and consulting a natural-minded health professional is a very good idea to help you with all of this. Learn from Joette here how to heal at the root of the cause with homeopathy: Good Gut Bad Gut. In the meantime, you may need to start by giving your digestive system a “break” and avoiding ALL grains and dairy for now. Do this for a month and see if you feel better. Those two are the most common inflammatory offenders that are hard on a compromised gut. Hopefully you won't have to avoid them forever, but just until you heal. Check out my post about when I did this for a month — there's support and meal plans and lots of info at that link. Healthy probiotic supplements are a MUST. I have a friend who struggles with constipation and will only go once a week unless she is consistent in taking probiotics. Probiotics build up your health gut bacteria, which is a MUST for everyone, especially those suffering with digestive system problems. You may need to start off slow or you could get a toxic die-off reaction which is not pleasant. Cod liver oil – this provides the very important omega 3 fatty acids and is an anti-inflammatory food. If you do all of the above and are not feeling better, you may need to look into the “big guns”, the GAPS Diet, to heal your gut and strengthen your immune system. Read the GAPS book here. Have you read the book, The Maker's Diet, with the story of how Jordan Rubin healed himself of Crohns Disease with diet? For some nutritious probiotic foods to build up your healthy gut flora more, if you can tolerate dairy, try making yogurt or kefir! Here's where to get starters and detailed instructions. Or read my post about how easy it is to make dairy kefir and how to make yogurt. Reminder: I'm not a doctor, seek professional help when implementing any natural remedies. Always use common sense. Looking for the Best Heartburn Relief? Back Away from the Tums! I am really enjoying your blog – glad I found it! I didn’t realize how much my probiotics were helping me until I ran out for a week or so. Won’t let that happen again! Not only did it effect my digestion, but my RA pain levels increased too. I need a convincing argument so that my mother will get me PrescriptAssist probiotics now rather than Bio-Kult…. Rhiannon F S Lynn – it’s not so much the strength that’s better with these it’s that they’re just more effective overall because all of it goes where it’s supposed to *and* actually causes good gut flora to proliferate. Josh Hanson. This article may be helpful. The Bone broth, probiotics and gluten free/dairy free diet also helped me immensely! Amy Pereira — this is wild that you’d recommend this article to Josh Hanson because HE is the very reason I updated this post in the first place and then emailed it to him, hopefully he got it and it helps! I take probiotics and just had a complete stool analyses. The results are telling me that I don’t have enough. I take the pill form. Could it be that the kind I take is not working like it should? Any ideas on this? The brand makes a big difference! My intergrative medicine doctor told me to switch brands. I think I read in the GAPS book that SBO’s don’t go all the way down to the colon and that they just do their thing and get out that they don’t populate the intestines. Did you hear this? My son and I have had digestive issues for years. To name a few, a real food diet, raw milk and probiotic has helped take care of all the problems. The only thing I would add to your above suggestions would be castor oil packs at night. My 6yrs old loves doing them and he sleeps better also. I have even used them for elevating asthma issues. There is a good description of how to do them in the book “Herbs of Grace” or I’m sure there is info on the internet. Thanks for providing such a great blog! My bowel functions have regulated and become easier. I have also felt a slight change in energy level. I am usually a bit fatigued and sore due to anemia, but lately I have been feeling less fatigue and a bit more energy. My head is reeling from all the info I am gathering. I am worn out….but in a good way. Without going into tons of details…(my little ones need me)…I am wondering if anyone can point out any good info on Gastroparesis, specifically, if there is anything I can do for my husband who suffers from it. He is unable to eat ANY raw veggies and very few fruits. His diet is sooo limited and unhealthy. He does takes meds, but they are almost useless for his pain and discomfort. Any info would be much appreciated. I am still reeling over raw milk..we have drunk non-fat forever….how will I ever convince my kids? Ah..but that is another topic. I have been on this site for hours today…need time to process all the info. I am excited though! I know this is long after the post, but an idea for converting low-fat or skimmed pasteurized milk drinkers to raw milk is this: Dilute the raw milk with water. For skimmed milk drinkers, about half & half of each. That way, you still get all the good fats from the raw milk, but its consistency is more like skimmed milk than whole milk. My mom was told this by an ayurvedic doctor a couple of years ago and has been doing it ever since. It also cuts your milk bill in half. I agree. Whole pasteurized milk has a heavy and dead taste and feel to it. Paula, this is the exact post I’d send you to if you weren’t here already. Did you try any of the above, especially the GAPS diet? I would recommend you find a local practitioner who is knowledgeable about these things and they can help you through this. Start by talking to your local WAP chapter, hopefully they can refer you to someone. I will pray that you find the path to total healing for your son! Please come back here and update us when you can. Kelly p.s. I found a couple more good links for you: https://www.westonaprice.org/Seven-Tips-to-Enhance-Digestion… and https://www.westonaprice.org/Gastro-Esophageal-Reflux-Disease-GERD.html. Kelly – PLEASE help. My son has stomach issues. The dr wants to put him on a strong antacid. Neither my husband nor I want this and want an alternative. ARe there antacids out there that are natural? What does NT say about antacids. Thanks for any help. The dr said we were welcome to do research before deciding how to proceed. I’m emailing you…hoping you might consider doing a guest post?! I have had a long journey trying to sort out my digestive issues. I was diagnosed with IBS years ago but I found that diagnosis highly improbable. I couldn’t figure out what my problem was even though I tried rotation diets, candida diets, low carb diets. There just didn’t seem to be a pattern to my symptoms. Then I finally suspected corn syrup, corn starch or dextrose and cut them all out. My condition improved but not enough so I started doing research. It was then that I found all the hidden corn derivatives in the typical diet. I think that a lot more people may be sensitive but just don’t realize it because it can be so confusing. Once I thought it was dairy but dairy only gave me a problem because pasteurized dairy is vitamin enriched and most vitamins and medicines start from GMO corn and soy. Not to mention the hefty dose of dry milk powder which is high in free glutamic acid and a source of oxidized cholesterol that is also included. I also thought it was wheat at one time because all our grains (even some whole grains) are enriched with synthetic vitamins. Actually, my main problems were corn, free glutamic acids, and soy. Anyone that has unexplained digestive issues should try the test diet at Battling the MSG Myth. It will help narrow down the problem by removing all the questionable ingredients that sneak into our food. In my case I started feeling better in a matter of days since free glutamic acid is one of my sensitivities and it just so happens that most is made from GMO corn or soy. That was not the end of my journey but it put me on the right road. Since I went undiagnosed for so long, I developed many other food sensitivities so I am starting the GAPS diet. Right now at least I have the information that I need to avoid symptoms but I want to go even further and try to heal myself and GAPS is designed to do that. Wish me luck! One other note, the diet that most people at msgmyth.com follow is the typical low fat, high grain diet. I don’t agree with that and try to educate and convert whenever I can but the information on how to avoid free glutamic acids is priceless. Many people there have cured migraines, seizures, IBS, reflux, arrhythmia just by avoiding these harmful additives. I’m sorry you’ve had such trouble, take a look at the GAPS Diet and see if it sounds like it could help you. No promises of a “miracle cure” – but it has helped many. Please cure my digestive problems! NOTHING WORKS! I have even had a cecal vovulus and I am only 22! That IS interesting…I hope someone else will jump in and have some information for you, I have never heard of that. The one thing I have heard about kefir, though, is from someone who couldn’t drink it (don’t remember her symptoms), so she started out drinking VERY small amounts and gradually worked her way up and now she has no problems. You bring up a good point about how stress affects IBS. Another great thing about the GAPS diet is how it helps with depression and other mental issues – not that stress is the same as a depression, but this diet can heal the problems in the immune system, which can affect how we handle stress AND how we digest our food, instead of just treating the symptoms, as you talked about. If you ever decide to do the GAPS diet, I’d love to hear about your experience. This was a nice, general post that had some great ideas and comments! I think it’s important to communicate about digestion, so many North American’s suffer from digestive issues. As someone who has IBS since a child, a very important part of my symptom management is stress. One of the most recommended treatments for IBS by physicians in anti-depressants…. yup. IBS (more so than others) is closely tied to emotion and stress. Expecting to manage the symptoms without managing the cause won’t prove as beneficial. Also- IBS symptoms are extremely variable and can change from person to person- making a cookie-cutter program ineffective. I have found that there are definitely certain foods that are catastrophic- milk, yogurt, ice cream, smoothies of ANY sort (even good ones!) and raw vegetables. However, if I am stressed it really doesn’t matter what I eat, everything is going to be processed inefficiently and painfully (due to the intestinal peristaltic movements being sporadic and spastic). So- THE best method of managing my symptoms hasn’t been radical changes to diet… but stress management. I do yoga, I meditate, and I say NO, decreasing amount of personal and professional expectations. I’ve never been diagnosed with any GI problems, but I had symptoms that were never enough to see a doctor about. In college I used to drink Maalox antacid by the bottle, and kept a bottle stored in my book bag. Later the indigestion and heartburn came and went, interrupting my sleep, etc. I sometimes attributed it to red wine or too much fat, but turns out that wasn’t the cause. Sugar sweetened low fat yogurt also always gave me a stomach ache, but whole fat yogurt never did. Too much sugar frequently brought on stomach discomfort, too, no matter what the source of sugar. All the symptoms disappeared about 5 years ago when I dropped my sugar and starch consumption to only very tiny amounts (like the amount a small serving of 70%+ very dark chocolate). Looking back on it, the symptoms were worse when I was eating pasta, especially. I can eat the pasta sauces without pasta without problem, but with pasta, the heartburn returns with a vengeance. When my husband also dropped the starches at home meals, I realized it wasn’t just me…he no longer needed the warehouse-sized boxes of Alka-Selter, which he had previously been taking quite frequently. It has been years since he asked me to get more A-S for him. He hardly ever “toots” anymore if he stays away from bread. But if he eats bread or pasta when he goes out for dinner, he’s very gassy and sleeps fitfully. I suspect the gluten in the wheat was the main culprit all those years (though I still keep all starch & sugar low for my BG). Now I make an effort to avoid even small amounts of gluten-containing foods, but sometimes symptoms return if I am slack about things like regular soy sauce (contains wheat), etc. My son (2 yo) was recently diagnosed as sensitive/allergic to raw cow milk (but not goat milk), gluten and eggs. I am reeling from this! I am looking seriously at putting him and I on the GAPS diet as it appears he has candida. Thank goodness for goat kefir and fermented veggies! Katie, the GAPS diet recommends another way to increase your stomach acid: eat or drink something lacto-fermented (sauerkraut, beet kvass, kombucha) about 15 minutes before starting to eat. It works pretty well for me, when I actually remember to do it! Katie, Megan’s suggestions look very promising, you could also go to the links at the blog carnival mentioned at the top of the post, I’ll bet you’ll find more good info there. Tracy, I’m so glad to hear that you’re on the right track! My friend was diagnosed with Crohns, and because I have had such great results with my probiotic, I’ll probably recommend it to her. It’s important to note that conditions like Crohns, IBS, Colitis and others warrant doctor’s input before beginning a probiotic. I have had Crohns disease for 37 years–was diagnosed as a child and have been on so many meds. The last 11 years I have been learning and trying natural cures. There have definetely been some flops and things that just didn’t work so I kept trying . I was determined not to go onto meds again. For 18 months now I have been stricly following the specific carbohydrate diet which is the gaps diet too. It is done wonders for me. I still am on a welness journey as there are up and down days–but way more up than down and i am very hopeful. I also started taking oregano oil for a UTI but have felt better and better in my digestive tract as well and am hoping it’s related. supplements still bother me but I sure would like to try the cod liver oil. Megan, thanks for the info about GERD. My husband suffers from it–it’s not something to take lightly –it can lead to bigger problems. He takes priolosec, but would like to get off of it. I am interested in getting him to try the diet your husband was on to get him on the road to health. Also what you said about the fruit for helping digest certain foods is helpful. For years my husband had struggled with acid reflux and had gotten to the point where the doctors said his only option was surgery. He found a chiropractor who also did a lot of work with nutrition who informed us that when you have acid reflux and heartburn it is actually because your stomach does not have enough acid to break down the food so it then overproduces the acid. My husband went on a strict diet for 3 months of no grains, no dairy and no processed sugars to cleanse out his system and then slowly started adding foods back in. Now, whenever he eats something that may be difficult to digest he has something acidic along with it (orange, grapefruit, pineapple, etc.). The acid from your food then helps break down your other stomach contents. It is barely even an issue for him anymore! And to think the doctors wanted him to have surgery! My mom had acid reflux all the time. She was on prescription medication for it. She started juicing greens and the acid reflux went away. She was able to stop taking the medication. 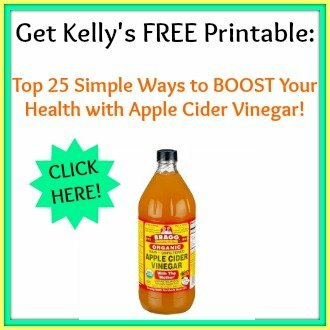 Kelly, you are a wealth of information, an online encyclopedia, a GPS of wellness! Thanks for sharing this ferris wheel of ideas in today’s Natural Cures blog carnival! Do you have any suggestions for low stomach acid? My husband suffers from this, and was finally diagnosed about a year ago. We tried apple cider vinegar with meals, but he couldn’t handle it, so our next try was Betaine HCL. He takes 1 capsule with every meal, and it has done wonders for him, it’s fantastic. But if you have suggestions for things we can do to get rid of the need for the Betaine HCL, I’d appreciate it! Greens. Have your husband eat greens daily (Kale, collard greens, mustard greens, etc). Juicing greens will work also. If you have low stomach acid, consuming greens daily will restore it. I used to have to take Betaine HCL with every meal in very large quantities. Then I watched Victoria Boutenko’s DVD titled “Greens Can Save Your Life” and learned that consuming greens would fix the problem. So I started juicing with greens daily and I got my digestion back! I no longer have to take Betaine HCL! If you have heartburn regularly, consider eating or juicing greens daily as well, to see if it helps. My mom started juicing greens daily and she was able to get off of a prescription medication she had to take daily for heartburn. It works! Just be sure to rotate your greens regularly. Look that up on Victoria Boutenko’s Green Smoothie Blog to find out why. She has some great recipes there also. Best of luck to you. I’m a believer in natural foods to cure the digestive tract, which leads the immune system. I had colitis, along with an immune disorder which led to asthma, chronic pneumonia, headaches. All these problems cleared up when I cleansed my digestive tract through natural foods and cut out refined sugar. It’s been almost two years without any illness – Praise be to God! The journey was challenging – especially cutting out sugar! After the physical cravings departed, I had to work on the mental cravings, which I overcame with much prayer and focus on God NOT on what I was missing. True health involves the mind, body and spirit.